Forest River Owners Group - The official owner's group of Forest River RV, manufacturer of world-class recreational vehicles. We've posted a list of Optional Tours, including names, descriptions, dates, times, and costs so that you can look them over and know what you want to select when you register. You'll find the list at https://files.constantcontact.com/52b7dac7401/e352e593-dc57-47f6-855f-cab568ee2f0a.pdf. 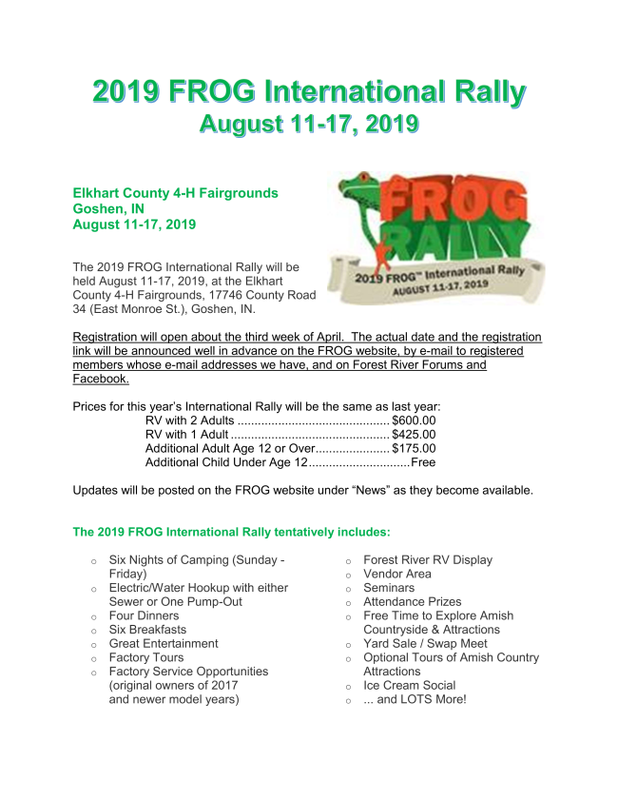 Whether you're a first-timer or you've been to the FROG Rally in the past, there's important information that you’ll need to know. We're compiling a group of articles to help you understand the registration and other processes and to have the most fun possible while you're in Goshen. We’ll be posting them on the “News” page as they’re completed. PLEASE take the time to read them before you begin the registration process. Volunteers: Volunteers are the lifeblood of this event. 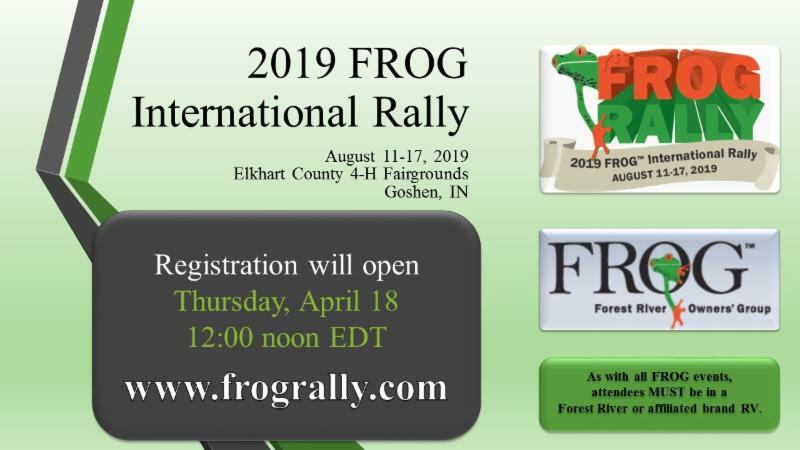 There will be a place on the registration form where you can volunteer to help at the FROG International Rally. We’ll need help with parking, registration, golf cart shuttles, building and grounds set-up, loading buses for tours, FROG Office and FROG Shop in the vendor area, setting up for dinners, and much more. You’ll be able to let us know the area(s), if any, in which you’d like to help. From those volunteers we’ll select and notify teams. There will also be opportunities to volunteer after you arrive. Factory Service: As was the case last year, there will be limits on factory service. Service will be available to original owners of 2017 and newer model RVs. Up to two service items can be requested. Shortly after registration closes, we'll set up an online site where you can request service under the guidelines shown above. Even if your unit is older than a 2017 model, we’ll request your 17-digit vehicle identification number (VIN) at registration so that we can check for and address any outstanding recall issues that you might have. Please have it available to enter so that we don’t have to request it and manually enter it into multiple files later. Optional Tours: We are working on the Amish area tours that will be available this year. These are not included in your rally fee. When the tour planning is completed, we’ll post schedules and information about them on the “News” page. We encourage you to review the information on these tours before beginning the registration process. For the first time, we’re looking at some “early bird” tours to allow more people to be on the grounds during the rally. Frequently Asked Questions (FAQs): There are a lot of questions that come up each year, so we'll compile a list of some of the most frequent questions and answers to help you in your planning. Complete information about registration, frequently asked questions, prices, tour descriptions and more will be posted under the "NEWS" tab on the black bar on the FROG website as they become available. We’ll also send newsletter notifications to those FROG members whose e-mail addresses we have, and we’ll will post the information on Facebook and on the Forest River Forums. We’re looking forward to another great time, and we hope you are, too. FOREST RIVER OR AFFILIATED BRAND RV. WITH NO NOTICE AND WITH NO REFUND DUE. Become a member of FROG by filling out the form, today! Have a question about FROG? Contact Us by filling out the form, today! Read our FROG Newsletter periodically for the latest information about FROG. Purchase apparel, swag, and other merchandise at our FROG Shop. Stay up to date on the latest FROG News by visiting the site frequently. Get answers to some of our most Frequently Asked Questions! © 2019 ForestRiverInc.com, a Division of Forest River, Inc.